in Alexandria examine bodies of victims. Just over a year ago, Amira Maurice was attending a New Year's Eve Mass in the Saints Church in Egypt's Mediterranean coastal city of Alexandria with her fiancé, their marriage set for only a few months away. Then a bomb blast ripped through the church. Now, the 28-year-old pharmacist is in Germany undergoing the latest in a string of surgeries to save her leg and deal with her burns. Her fiancé is dead, one of the 21 people killed in the suicide bombing targeting the church (for more on the attack, click here). 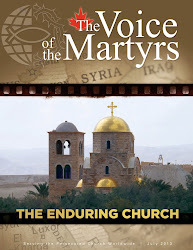 The one year anniversary of the bombing of the Saints Church in Alexandria has passed with no new insights to the case. 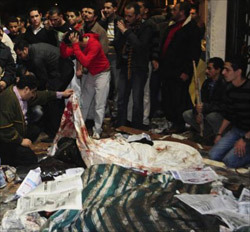 Named as Egypt's most dramatic anti-Christian attack, the bombing killed 21 people and wounded many more. While a few suspects were detained, they have since been released and no other inroads have been made in the investigation. Please continue to lift this situation to the Lord in prayer. Pray for those who continue to grieve the loss of loved ones. Pray for the wounded who continue to heal from the attack. Pray that the perpetrators will be located and that the authorities will justly investigate the event. Pray that religious freedom will be respected in Egypt. For more on the trials believers face in Egypt, go to the Egypt Country Report.